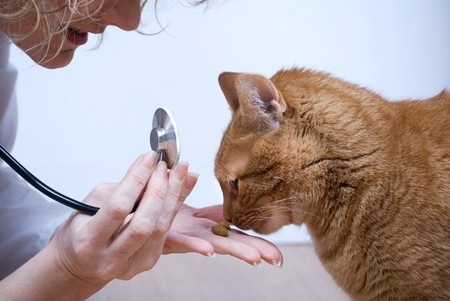 Is your dog or cat offered treats during the visit to the veterinarian? I can think of two reasons why this might not happen. The vet doesn’t dare feed treats in case the animal needs to be sedated, thinking that “animals need fasting before sedation”. Feeding treats at the vets is not coddling – it’s a way to prevent and reduce fear. For several years, I’ve been teaching about fear, anxiety and stress (FAS) in pets during veterinary visits. Among several topics, I’ve spoken about why treat feeding is such a powerful technique to reduce and eliminate – and prevent – fear and fear learning. This is called counterconditioning. “That sounds great”, the vets would say. “But if we need to sedate them, we can’t feed them so soon before we put them under”. How soon before sedation can we feed, then? What if you just feed a teeny weeny little tidbit? How about broth – liquids surely must have really short gut passage time? How big is the increase in risk if you do feed before sedating? How dangerous are the complications, anyhow – would the benefits be worth the risk? As a scientist, my knee-jerk reaction was to look for the article that addressed those questions. I didn’t find one. There wasn’t any. Nobody had looked at that! I rate her as the leading Nordic expert in non-human primate behaviour.